This book starts with developing an application from scratch. Right from creating the layout of the home page to home page elements including left and right sidebars, to placing tree like navigational menu, menu bars, tool bars, banners, footers are discussed with examples. You will see how to create forms using the Ext GWT library widgets and handle different types of events. Then you will move on to see how to design a database for sales processing systems and learn to create the database in MySQL with the help of easy–to-follow recipes. One of the interesting topics of this book is using JPA in GWT. Using the JPA object in GWT is a challenge. To use them perfectly, a mechanism to convert the JPA object into plain object and vice versa is required. You will see recipes to use entity classes, entity managers, and controller classes in GWT application. You will efficiently create reports with parameters, variables and subreports, and get the report output in both HTML and PDF format using real-world recipes. You will then learn to configure the GlassFish server to deploy a GWT application with database. Finally, learn how to trace speed and improve perfomance in web applications using tracing techniques. Create impressive web applications with tool bars, menus, multiple windows, and more with this step-by-step guide. The recipes in this book are in a straightforward and easy to follow format.The range of topics covered in this book will bring out the forward-thinking Java developer in you. 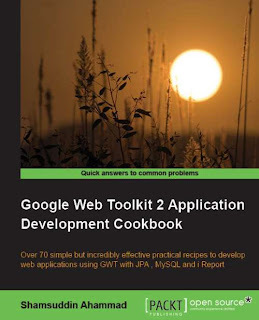 If you want to build AJAX web applications with GWT then this book is for you. Developers with prior programming experience of Java development and object-oriented programming will find this book very useful. Introduction: Ext GWT is a Java UI component library for building rich Internet applications with Google Web Toolkit. In this article we will learn how to setup the Ext GWT in NetBeans GWT project. If you have not created the GWT project in NetBeans yet, follow the post Creating GWT Project in NetBeans. 2. 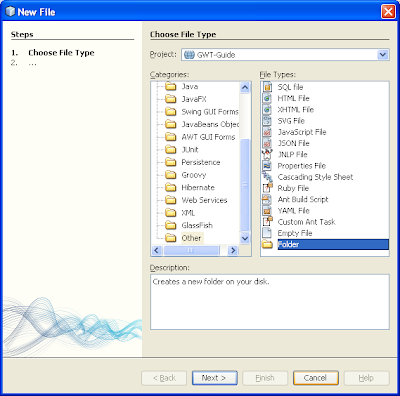 Open the GWT-Guide project in NetBeans. You can download the sample project here. If the GWT4NB plugin is already installed just directly follow the steps below, otherwise read GWT4NB : Plugin for Creating GWT Applications in NetBeans first. 2. Select Java Web from Categories and Web Application from Projects; press Next. 3.Give a Project Name, Browse the Project Location; press Next. 4. Select the Server, Java EE Version and write the Context Path; press Next. 5. Select Google Web Toolkit from Frameworks, Browse GWT Installation Folder, write name for GWT Module; press Finish. GWT Project is now created. You can download the created project here.